Are you craving a balanced meal with perfect nutrition, made in seconds? If yes, it’s time to invest in a good pressure cooker which gives a better performance and may save you a lot of money in the long run, compared to many traditional kitchen appliances..
How Good Is A Pressure Cooker? is its ability to save you time. In comparison with traditional cookers, it can shorten your cooking time by up to 70%, which makes it a lot of easier for busy people to quickly get a nutritious dinner on the table, especially your when time is more valuable than money. Efficient Operation: Many pressure cookers are created to ensure you get faster cook times and consistent results without heating up your kitchen. And because they’re built with many safety measures, there is no need to worry about explosions or fire disasters. Believe it or not, they all are 100% safe to use. Healthier meals: As a matter of fact, foods can retain more nutrients when they are exposed to heat for a shorter amount of time. Not only that, by creating an environment that allows water to boil at higher than 100°C, it makes a huge impact by effectively eliminating harmful microorganisms. Choosing this cooking method means that you are choosing a healthy way to get your daily dose of vitamins and minerals. Easier cleanup: Thanks to the compact design and the non-stick, dishwasher safe inner pot, most pressure cookers are very easy to clean. They’re also super easy to maintain and take care of. How to choose a good pressure cooker? To make sure that you will end up with the best possible product, we strongly recommend you consider each of these main factors below while browsing your options. There are 2 types of pressure cooker for you to choose from, including stovetop pressure cooker and electric pressure cooker. While both serve the same function and ensure to give you the best cooking experience, they definitely have their own features to strengthen their performance. Specifically, the electric pressure cooker is more convenient and a bit easier to use, since it’s developed with more possibilities. Some of these features available can be a barometer, thermometer, a timer, and a wide range of cooking options. Many appliances even have an auto shut-off function to give you greater peace of mind. When these appliances possess many exclusive features, of course, their prices are usually higher. Also, due to the housing around the cooking pot, it seems to be bulkier, which is clearly unsuitable for those with space constraints. The stovetop model, on the other hand, can cook food relatively faster and is extremely easy to store. However, it does require a bit more attention while producing more noise in use. To cover a wide variety of needs, pressure cookers are designed in various sizes, from as small as 3 quarts to as large as 8 quarts. Choosing the right size will highly depend on the requirements of your home or the size of the meals you plan to prepare. Overall, a 3-quart pressure cooker will be an ideal option for singles, couples, or small families with 2 members. However, if you are finding something that is large enough to do some batch cooking for a medium-sized family, a machine with larger capacity ( 6 or 8 quarts) may never let you down. Pressure cookers are also available in different price ranges to suit everyone’s pocket. Some models may cost more than $800, while others can cost up to several thousand. In general, high-quality models are pricier and provide much more cooking options. This means that the more you spend, the more advancements you will have. So, before you buy, make a list of desired features you would like to have and you’ll be surprised by how much you can save just by thinking ahead a little. Here are my overview of the 7 best pressure cookers. Some of the information is collected from my personal experience while the rest are collected from online reviews. Hopefully, through this post, you can find what you’re looking for. Coming in three different sizes ( 3,6,8 quarts) yet equipped with the same functions, the Instant Pot DUO60 is exceptional in its ability to speed up cooking by 2 to 6 times while consuming up to 70% less energy. If you love cooking but hate the hours spent behind a stovetop simply because you don’t have a lot of time, for sure, you will immediately fall in love with this model. This machine has a multitude of options which make a distinction between a high-price tag model and a traditional one. You can use it to sauté, slow cook, and even pressure cook, either with manual settings or with the push of a button. The stainless steel inner cooking pot is another trait that puts this electric cooker well above its non-stick rivals. With no chipping and dangerous coating, no matter what has been cooked in it, this part is always easy to clean. I especially love it for cooking frozen meat, as there’s no need to defrost the meat first. It cooks and defrosts all at once, saving you time and hassle. In terms of safety, this unit is UL and ULC certified with ten different safety elements and is built according to North American Electrical Standards. It’s kitchen-friendly! Even when cooking, the external environment undergoes no minute temperature change, meaning explosions never happen at random. No more worries about your family’s safety. The only drawback that I have experienced is that the machine isn’t good for canning foods as it cannot maintain a steady heat or come up to a pressure high enough to perform this function safely. You’ll need a stovetop pressure canner to be safe. But wait, don’t panic! It has lots of safety features; as long as you follow the directions thoroughly, it’ll be fine. Want to learn more about the whole Instant Pot collection? Check our previous review! Truly, I’m very happy with this magical creature which not only exceeds my expectations, but also makes my life so much easier and healthier. If you’ve been toying with the idea of buying a pressure cooker, I honestly advise you to consider the Instant Pot DUO60 model. It’s definitely the real deal with excellent performance. Do you find yourself short on time to cook? If so, this all-in-one electric appliance could be your solution. Mealthy lets you have a powerful and unique pressure cooker at a less expensive price, compared to the Instant Pot. Yet, this appliance features many of the same core attributes, like the variety of cooking programs, a stainless-steel steamer basket, and an easy-touch LCD panel. Some claim that this feature set is even stronger than that of its counterpart. In an effort to offer customers greater efficiency and more flexible cooking options, they also pack their products with countless bonus attachments. To name a few, there is a steam basket for preparing two dishes at once, pot holders for picking the inner pot out of the cooker, a 4cm raised trivet for keeping food out of liquid, and silicone mitts for safer inner pot removal and transport. All these accessories are super durable, easy to hand wash, and totally dishwasher safe. No more messy scrubbing or struggling with a bunch of parts in the sink. Just throw them into the dishwasher, and let it do the rest. With the MultiPot, users can not only get delicious, evenly cooked dishes, but they can do so in less than half the time of regular cookers, saving them a lot of time and money spent on utility bills. It would be a perfect appliance if the inner pot had a smooth, non-stick surface, which would make it easier for instant serving and fast cleaning. Also, while there are the Mealthy site and mobile app for IOS and Android where you can gain access to thousands of tasty recipes, almost none of them can be used for MultiPot. Instead, they are written for the Instant Pot. For me, however, this is not a huge problem, as it doesn’t seem to affect the machine’s overall performance. So far, this programmable pressure cooker delivers on its promises for a very reasonable price tag and is certainly worth the space on your counter. If you’re seeking a multifunctional pressure cooker that efficiently performs a variety of cooking tasks, don’t let this value slip through your fingers! Made in Wisconsin since 1930, the All-American pressure cooker guarantees to give you complete peace of mind in knowing that your cooking process is entirely secure. You’ll also appreciate that it can be done ahead of time. The biggest selling point, perhaps, is the exclusive “metal to metal” sealing system that enables a steam tight seal. Unlike other pressure canners that employ a rubber gasket in the lid to form the airtight seal, this machine requires no gasket, as a result, opening and closing the lid is also much easier. I know some people who distance themselves from using the stovetop pressure cookers due to safety issues. This is because there used to be many extremely large explosions or fire damages caused by user negligence. Wait, wait, don’t panic! It’s just something that happened in the past. Modern pressure cookers, including this one, are not that bad. With the metal-to-metal seal, two automatic venting features, and over pressure plug, you are completely protected from any product defect. In addition to 3 different pressure settings: 5 psi, 10 psi, and 15 psi, bringing a lot of flexibility, it also has an easy to read geared steam gauge and comes in various size options, so you will have a wide variety to choose from. Thanks to that, you won’t ever have to worry that your family gatherings will be anything but fun and tasty foods. From my research, this canner is not intended for canning fish. It isn’t appropriate in commercial use, either. Above all, try to avoid using it on glass top or flat ranges daily, as its relatively heavy weight may cause the glass or ceramic to break. Made of durable, hand-cast aluminum with an attractive, easy to clean satin finish, this well-built machine is obviously a cool replacement for our grandmother’s stovetop pressure cookers. It’s perfect in so many ways: size, price, and quality. You really can’t go wrong with this purchase. I highly recommend this model for those searching for a pressure canner that, a. is perfect for all their canning needs, and b. lasts for years to come without requiring any special storage methods or costing them a fortune. Capable of canning large quantities of food in a very short amount of time, the Presto 01781 not only promises to enhance your canning experience but also makes it easier for you to achieve the best results. Unlike the All-American Canner, this product is acceptable for use on glass top stoves regularly (according to the description). It’s also exceptional in its ability to double as water bath canners for preserving fruits, jams, jellies, pickles, and salsas. Its unique features also include the air vent/cover lock that only allows pressure to accumulate when the lid is closed properly and an automatic light that comes on to help you easily keep track of your cooking process when it’s dark. On top of that, despite the large size and solid construction, it’s incredibly lightweight, easy to carry as well as doesn’t take up much room in your kitchen cabinet. Equipped with many special attributes, though, it only has one pressure setting, which makes it less competitive than it needs to be. But overall, its performance is top-notch, especially for this price tag. Constructed of warp-resistant heavy-gauge aluminum metal that is widely known for heating up faster, this durable kitchen tool will serve you well and thoroughly care for all your canning needs. For me, at this cheap price point, it’s a no-brainer. When it comes to programmable pressure cooker packed with all kinds of goodies that will be extremely beneficial, at present, no one does it better than the Yedi manufacturers. As a pretty popular all in one electric appliance, it stands out from the crowd by offering users up to 15 easy-touch cooking programs as well as allowing them to manually input cooking times and set different pressure levels as desired. Not only that, in mere minutes, you’re able to complete two dishes at once thanks to the help of the included stainless-steel steamer basket, which is very easy to clean and totally dishwasher safe. Plus, its food grade, stainless steel inner pot featuring a 3-ply bottom for even heat distribution is spacious enough to make enough food for the whole family of 4. This part requires no any chemical coating to make it non-stick as well. More impressively, there is no need to buy extra accessories to fully utilize the tool, as everything comes in one box and all works very well. And, in the event you don’t know what to do with these attachments, it also comes with a detailed instruction manual and a recipe book, which will inspire you to try out an endless amount of recipes everyday. It’s generally agreed that the Yedi Houseware Appliances website and mobile app for iOS and Android is not really helpful regarding recipes that almost relate to the Instant Pot models. I think it would be wiser if the Yedi manufacturers had their own and unique food preparation methods so as to make their product much more competitive. Whether you’re new to pressure cooking or have a lot of experience already, this unit is a must-buy because what you’re going to gain from it is not only value for money. It’s more. Are you looking to save money and reduce electric consumption? If yes, then look no further beyond our pick of the best pressure cooker under $100 – the MUELLER 10-in-1. This product is loaded with up to 19 smart programs and an extra stainless steel rack which enable you to comfortably prepare 2 dishes at once. So all you have to do is press a button and let it do the rest of the work for you. There’s no need to figure out how to perfectly cook your favorite dishes by yourself. With the Mueller, you and your family can enjoy the beneﬁts of better, faster, and healthier cooking every time without spending a lot. Made from German-engineered rubber seals, strong reliable heat resistant handles, and internal electronics for durable and long-term use, it guarantees you many years of trouble-free operation. The one clear drawback to this crock pot is the lack of direction book. Also, for some people, its 6-quart capacity, which is just flexible enough for daily use, seems to be relatively small. So if you’re looking to entertain your guests for the weekend, I think you may need a larger pot. Not only is this machine made with the highest quality components, but it also comes equipped with all the modern safeguards to ensure you long-standing performance. Don’t let its inexpensive price fool you. It gives more than you may ever expect to receive, satisfying even the toughest requirements of any users. Next up is the very classy but incredibly well-made pot coming from the Ninja collection – the Ninja Foodi Multi Cooker with TenderCrisp Technology. It is an all-in-one kitchen tool tailored to replace many popularly-used appliances, including a steamer, a pressure cooker, and an air fryer. Therefore, it can handle several cooking tasks like baking, roasting, broiling, and oilless frying very efficiently. It has an easily accessible front control panel with an easy-to-read timer. It’s so simple and straightforward to use that no technical knowledge or learning curve is required while comfort and enjoyment are offered. For the most part, it employs a new technology called the TenderCrisp Technology that helps users to quickly get the best possible cooking results. In regard to safety and quality operation, its 14 levels of safety which already passed rigorous testing to get UL safety certification, have been improving over time and will continue to do so for years and years. In agreement with many buyers, the machine itself is fairly heavy and bulky. This means it can’t work wonders in a limited cooking space. I’m also quite annoyed with its non-removable air lid, which is obviously not user-friendly for cleaning. In general, the Ninja Foodie has done an excellent job in both pressure cooking and air frying. Compared to these reviewed cookers above, it comes with more advancements. But, at a higher price it is not really ideal for those with space constraints. At the moment, Instant Pot is a big name that’s been around in the industry of pressure cooker for a long time, living up to its name by consistently providing great quality product and top-notch customer service. Till now, the Instant Pot family consists of 5 members, namely the LUX, the DUO, the DUO PLUS, the SMART, and the ULTRA. All are formed to serve one purpose: taking your cooking game from stressing to blessing. 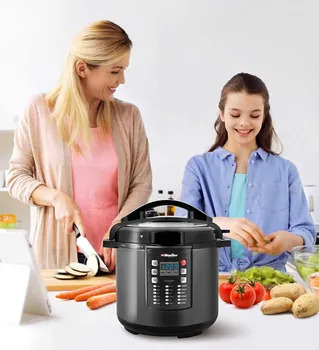 In addition to the basic function that exists in other traditional pressure cookers, many Instant Pot models will come with extra cooking programs, such as soup, stew, cake, egg, sauté, rice, multigrain, steam, porridge, keep warm, and slow cook. Some even can allow users to set time, temperature level, or program and self-control the cooking progress via the Smart Pot App. With a ton of benefits offered, there’s no denying that the Instant Pot manufacturers have changed the way we cook and the way we look for inspiration. Even though they might not meet all the requirements of some of you, these amazing items are absolutely a smart upgrade for those wanting to develop healthy eating habits.